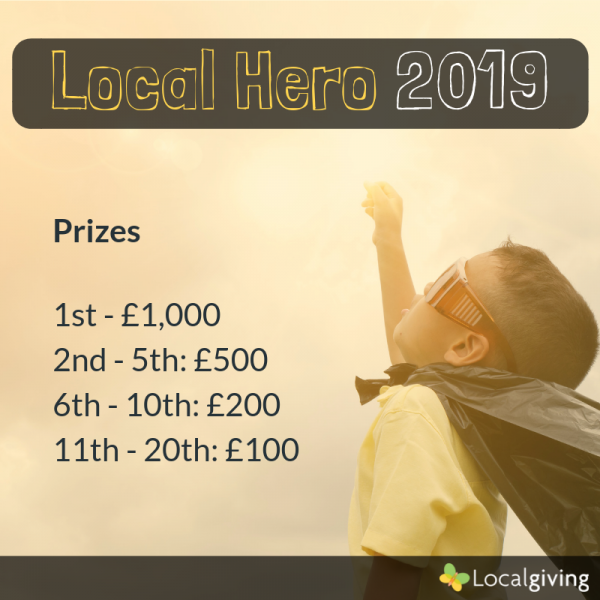 Local Hero 2019 is now live! This year's campaign kicked off on 1st April 2019 and will run until 30th of April 2019. Throughout the month we will highlight the incredible ideas and feats of local charity fundraisers. During the competition participating fundraisers will be ranked on the Local Hero leaderboard according to the number of unique online donors who sponsor their page. The top 20 fundraisers will be given prizes ranging from £100 to £1,000. Overall, £5,000 in prizes will be distributed among the causes supported by the winning fundraisers. During Local Hero 2018, 343 fundraisers raised over £109k for 171 local charities and community groups across the UK. Here is a list of the key facts about the campaign. If you have any more questions, please check the Local Hero FAQs. Conditions of entry: Each active fundraising page on Localgiving will be eligible to take part. Process: Fundraisers will be ranked according to the number of unique donors who sponsor their page within the campaign start and end dates. Donations made outside of the campaign dates will not be counted towards a fundraiser's ranking. Prizes: The top fundraisers at 23:59:59 on Tuesday the 30th of April 2019 will be declared the winners. Prizes will not be given to the fundraiser, but awarded directly to the charities for whom they are fundraising. Charity & supporter limits: Only one donation made by each unique donor will be counted towards a fundraiser's ranking. There will be no limit to the number of prizes any single group could receive. If your charity or community group would like to take part in Local Hero and are not yet a Localgiving member, why not join today! Taking on a challenge in 2018? Start fundraising now and you could be this year's Local Hero! Check out the FAQs to get clued up on how the Local Hero campaign works. If you have a question we haven't covered, give us a call on 0300 111 2340 and we'll be happy to help! How do I take part in the Local Hero campaign? Supporters simply need to set themselves a challenge, create a fundraising page through Localgiving and ask their friends, family and colleagues to sponsor them at any time between the 1st and 30th of April. Each fundraising page will be automatically included in the campaign. The more people that sponsor the page, the higher up the leaderboard it will rank. What are the prizes and how are they awarded? The fundraisers that secure the greatest number of donations from unique donors throughout April will secure prizes for their chosen charity. In the case of a tie, fundraisers are next ranked by the total amount raised. At the end of the campaign £5,000 in prizes will be distributed among the causes supported by the top 20 fundraisers. As a fundraiser, can I set up more than one fundraising page? Yes - go for it. However, you can only set up one fundraising page per group. Can a team raise funds through a fundraising page and take part in the campaign? Yes, groups or teams of fundraisers are eligible to take part in the competition, but only one fundraising page per team will be eligible to receive a prize. Can more than one fundraiser fundraise for a charity? Yes, there is no limit to the number of fundraising pages that could be set up to support any single group through the campaign. Can I make more than one donation to a fundraising page? Only one donation per donor per fundraising page will count as points towards the Local Hero contest. You can, however, donate to more than one fundraising page and have your donation counted towards the ranking of each fundraiser. The option to claim Gift Aid and add an extra 25% to your donation will be available after your payment has been processed. All boxes needed to have been checked and answers made honestly in order to ensure that you make a legitimate claim. For more information on Gift Aid rules, please click here. Is there any limit to the amount I can donate? You can donate any amount between £2 and £5,000 in a single transaction to the fundraising page of your choice. Your donation will count as one point towards the ranking of your chosen fundraiser. Are monthly Direct Debit donations eligible? No. Only one-time donations made through fundraising pages count towards the Local Hero competition. No. Only one-time online donations will count towards a fundraisers ranking. Is there a limit to the number of prizes each charity can receive? No. The winning charities will be selected according to the rankings of the top fundraisers at 23:59:59 on Monday the 30th April 2019. One charity can receive more than one prize if multiple fundraisers are in prize winning positions. Where did the funding for the campaign come from? Funding for 2019's campaign is being kindly provided by a private philanthropist. The scores on the leaderboard seem to have changed since the campaign's end? What's going on? Our technical system automatically excludes repeat donations from donors who use the same email address. However, it does not always detect when a donor has used the same name and payment method, but a different email. In order to ensure a fair competition, we manually verify these cases and consolidate the donations to represent one unique donor. This process may slightly affect some of the scores.